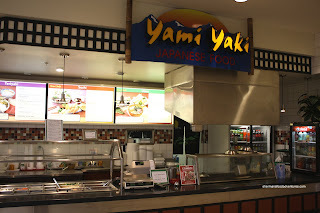 Last time, while I was regrettably picking up "Chinese" food from Hang Lee at Scottsdale Mall food court, I noticed Yami Yaki nearby. Now, when I say food court, I really mean Hang Lee and Yami Yaki only. You see, there used to be more food stalls here including McD's; but the place just ain't too popular and places to eat has dwindled down to 2. 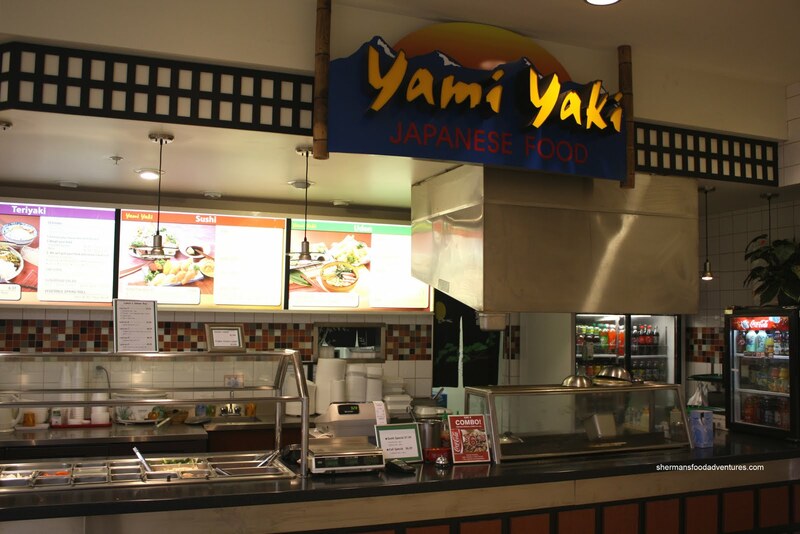 This time, I aim to complete the Scottsdale Mall food court experience by getting some takeout from Yami Yaki. Since there are only 2 places to eat here, I guess Yami Yaki tries to be more than merely Sushi and Tempura. Rather, it's got this Koya/U-Grill thing going on where you can pick your ingredients and they'll cook it to order. I stuck with the Japanese food this time with a combo; but they ended up cooking my Yakisoba fresh on the flattop. As for that Yakisoba, by virtue of being prepared fresh, it was pretty good. 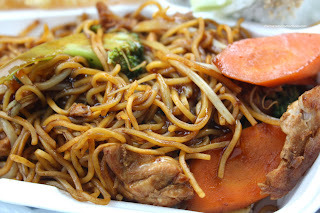 The noodles were slightly chewy, chicken was tender and veggies crisp. Maybe a touch too much sauce though. 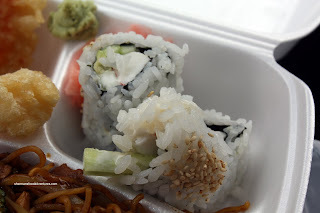 I realize that I shouldn't expect much out of the food here; but the Tempura was awful. 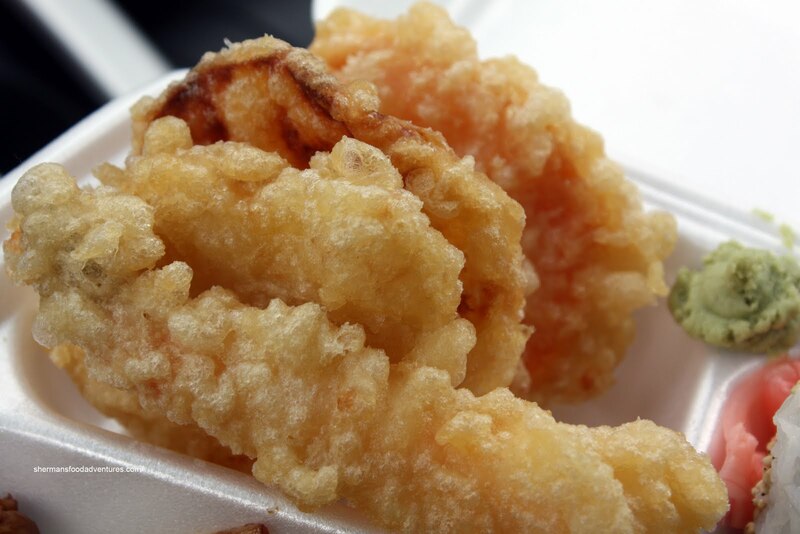 There was an obscene amount of gummy gooey tempura batter on each veggie. It acted like an impenetrable barrier between me and my veggies. Believe me, there is already many obstacles that stand in my way of vegetable consumption. Mind you, fried veggies don't really count when considering a healthy meal. Last item in the combo was the obligatory California Roll. Yah I know, nothing really all that exciting; yet it is user-friendly and safe. When you are 1 of 2 food stalls in a mall, it's best to not put something strange into the food. As expected, the roll was pretty darn average. The rice was bland and a bit too soft. The roll was not made with care and slightly stingy on the filling. Okay, despite my rumblings about how the food isn't that great, Yami Yaki remains a viable option for those in need of quick eats. Sure, the food ain't great; but it's made fresh and doesn't cost very much. The proprietors are friendly and honest people, who try their best to put out a decent product. With very little to compete against, in the mall at least, they will have their customers. The Yakisoba is the only thing you should order from here. Honestly, this place is the only reason I come to scottsdale mall. Love the people who work there, and I find it slightly better then u-grill. Especially the noodles. @Risa There really ins't much choice in the mall, so yah Yami Yaki serves a purpose.